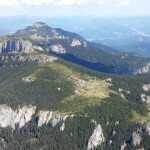 If you climb the mountain Ceahlau on the route bookmarked with a red line, that starts in the Durau resort – Cabin Fantanele – Piatra Lata – Panaghia – under Toaca Peak and goes up to the Dochia Cabin, you’ll see, after you pass the Panaghia Stone, the east side of Toaca Peak. If you go along the trail you’ll reach the top of the peek where you can also see the weather observer. In the clear sky days the view from up here is magnificent. As all the other important rocks from the mountain Ceahalau, Toaca Peak also has its own legend. The story talks about some giants that lived here. These people were ox breeders. One winter a disease killed almost all of them. Only a boy and a girl managed to escape with few animals. What they did next was to start building a tower each so that people from the east could see them. The boy managed to raise a bigger tower than the girl but both were wonderful and the people from the valley looked at it with admiration and respect. In the day the forest changes her color to green, a moment that is called Probajini, a cold weather rushed into the mountain killing every living soul. After the cold weather passed the people went onto the mountain to look for the two giants. They found them frozen under the ice. Since that day the big tower is called Toaca and smaller one Panaghia. 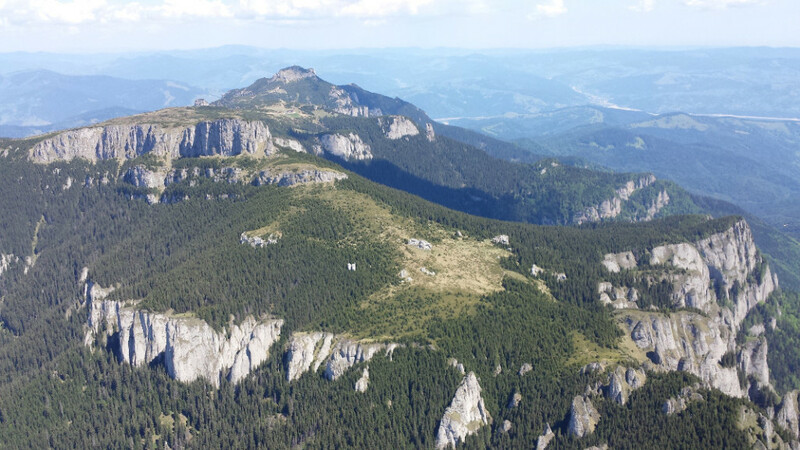 Read about other legends from Ceahlau Massif!